The Inspiring Young Emerging Leader (I-YEL) program is a paid internship that focuses on youth voice, youth empowerment, and demonstrating youth brilliance. For 7 months, from January-August you will commit to growing as a leader, exploring social justice issues in your community, participating in community service projects, and planning events for other youth. This program is youth-led and coordinated! Make up to $270 per month depending on participation. Transportation from a BART station or to the work site at Crissy Field Center in the Presidio. January-May you will meet every Wednesdays 5pm-7:00pm along with 3 Saturdays per month 10am-4:00pm. June and July you will meet 3 Saturdays a month with the option to earn up to $2300 with a summer internship in the Golden Gate National Parks. In addition, you are required to attend 3-4 overnights. 2018 3FM Register Here !! 3FM is a free food and one free movie event with games and prizes. College recommendation/letter of reference Transportation from Balboa BART or Stonestown to the work site at Crissy Field Center in the Presidio. Interviews will be held December 9th 2017 at the Crissy Field Center Start date Saturday January 6th 2018. I-YEL is starting a new internship program this fall! This internship is open to past UTB, LINC and I-YEL interns. The program will focus on building leadership skills thru planning and participating in community events. Thru facilitating activities for other youth, tabling at park events, and outreaching on behalf of the park, participants will define what it means to be a leader in their community. The program begins on Saturday, September 9th and runs thru December 9th. Program will meet 3-4 Saturdays a month with one overnight in October. Participants are paid $285 per month based on attendance and participation. Participants can work extra days mid-week to earn more money. All interns must be able to commit to full program. Applications are due August 8th! Interviews will be set up August 10th-15th and participants will learn their acceptance status by August 18th. We are back at Rob Hill this year for the sixth annual Backyard Bound! 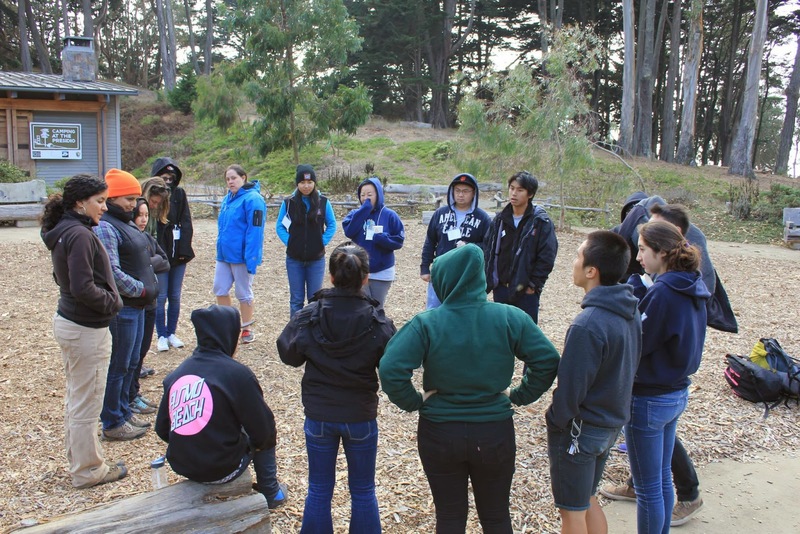 We Inspiring Young Emerging Leaders at the Crissy Field Center welcome Bay Area youth to come and express themselves at this years youth summit on Rob Hill's campground in the Presidio. We will be focusing on the importance of zero waste, which includes: not wasting your individuality, voice, or environment. This is a chance for Bay Area youth to interact and meet each other outside of city life through the comfort of the outdoors. Come join us for a time of fun and new experiences. Don't worry about bringing too much! We have you covered on sleeping gear and food throughout the whole trip! For safety and the limited staff capacity, we expect youth to join with their school or organization so we have enough chaperones to have a safe and well balanced time. Space Is Limited! Sign up TODAY! THIS EVENT IS COMPLETELY FREE! Come to our 2nd Annual 3FM! 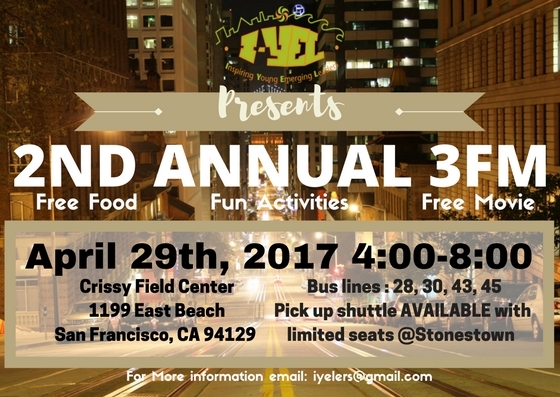 In preparation for Backyard Bound, I-YEL is hosting our second annual 3FM event for high school youth! As a sneak-peek to Backyard Bound, this year’s 3FM will feature activities such as, Escape the Room, Family Feud, and upcycle art. All activities are themed around the idea of zero-waste. BUT we've put a spin on it! We want youth to stop wasting not just natural resources but also stop wasting your voice and your passions and talents. After these workshops, we will be eating dinner and watching Moana! This is an event specifically for SF Bay Area high school youth to give them an opportunity to come out to their national park and get to know other youth from around the city, learn about this year's Backyard Bound through these fun-filled activities, free food, and an entertaining movie. This year's Backyard Bound will be June 24th-26th at Rob Hill. We will be sending out registration for Backyard Bound in April. For youth interested in attending our 3FM event please RSVP!!! - Chance to go to Alcatraz, Fort Miley Ropes Course and participate in The Amazing Race Presidio style! On behalf of the Backyard Bound Planning Team, it is our pleasure to invite you to participate in this year's fourth annual Backyard Bound summit for high school students! 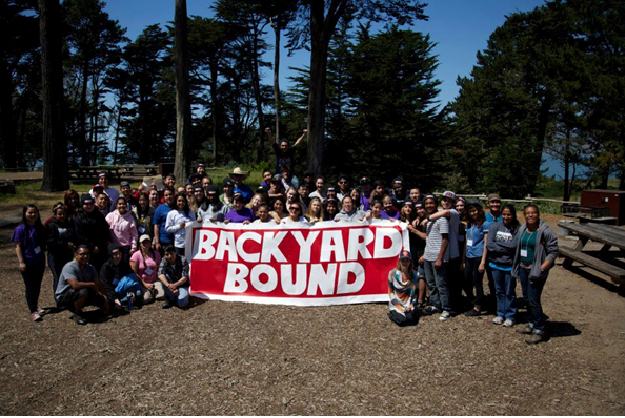 Backyard Bound is a chance for high school students to meet other youth from the San Francisco Bay Area. We will give you a great camping experience and we will have workshops that connect the aspects of freedom, technology, and the great outdoors. There is also going to be free catered food provided along with free baseball T's. LIMITED SPACE SO ENTER NOW! If you cannot afford the $15 registration please contact Carmen Chan, Youth Intern at cchan@parksconservancy.org for a scholarship. I-YEL 2014-2015 Applications Up Now! Please share with any high school aged youth, you think would be interested in earning up to $240 month while learning how to become the next leaders of tomorrow. Check out the blog to see what types of activities I-YEL interns take part in. I-YEL encourages, prepares, and challenges young people from diverse backgrounds to address environmental and social issues in their communities. Youth receive support and training to implement community projects as well as to coordinate their own programs and activities. Through leadership development, career exploration, and goal setting, I-YEL interns acquire the skills necessary to be the teachers and leaders of today and the future. Hello future and past IYELERS, this year’s summer trip of 2014 with the IYEL crew was at Whiskeytown. Whiskeytown was definitely a very interesting place to visit. Why Whiskeytown you may ask? Whiskeytown is a beautiful National Park that includes a lake, waterfalls, hot temperatures and biodiversity. It is what some may say, the perfect place for a summer trip because of the opportunity people have to swim into the National Park’s lake with perfect temperatures for the summer. The team also got the chance to kayak at Whiskeytown lake with the whole group, this gave the team a chance to work together as pairs on one kayak boat shared with two IYELERS. The IYEL team focused on creating four fun and educational lesson plans for the trip that focused on freedom because of Memorial Day weekend and Whiskeytown’s history. The lesson plans were presented by the four groups throughout the summer trip to keep excitement and energy flowing. We also wanted our fellow IYELERS to appreciate their time at the beautiful National Park by learning more about it, and realizing how freedom is important to them today. One of our groups focused on Social-Freedom and the way they expressed how Social-Freedom is important to them is by introducing the topic to us at the top of a waterfall, where they talked and had us participate in a game that made us realize about the water advantages the U.S.A has vs. other countries like Chad. The group that focused on Whiskeytown’s history presented their lesson plan to us by a really beautiful beach that was near our campsite. They had us learn all about the gold miners because a lot of them would visit this National Park before it was a National Park because of all the gold nuggets it included. They also had us work together as a team in the beginning like the gold miners did. We learned a lot of history about the national park from this group because they were reading off a lot of statements and they wanted us to figure out which statements were true and which statements were false. This way we actually got to learn a lot about the park by having a little fun at the same time. Our last day at Whiskeytown, a different group did a lesson plan about being thankful about each other and why it’s important to be thankful for the people around us. This lesson plan included a props activity where everyone had a card with their names written on the card and everyone in the group wrote a prop or why they were thankful for that person. This lesson plan made us appreciate one another a lot more, and it made us a stronger team knowing that we are all thankful for each other. Our trip to Whiskeytown was definitely something we are all going to take away with us. We all learned a lot about the National Park and its history, and the importance of freedom to us today. But the most important part of this trip is that it made us a stronger team. We got the chance to spend a lot more time with each other and to appreciate each other’s company, and it also gave us a chance to reunite with some old familiar faces which are the IYEL alumni. We were very glad to have them around and spend some time with us so that they can share their wisdom with all of us. We’re back with an update on our annual YEL Project, POLLUTION PALOOZA! In the weeks leading up to our event, we've split our team into four committees: Planning, Outreach, Video, and Building team—each working hard to make this event one to remember. The Planning Team has spent endless Saturdays figuring out the logistics, scheduling, and planning for our event. They've made countless revisions on our mission statement and schedule, making sure the day will run as smooth as possible. The Outreach Team has contacted numerous people through phone calls and emails requesting donations and organizations to table at our event. They've also updated many of our social media profiles including the I-YEL Facebook page (which you should totally check out), as well as created the logo! Video Team has been in charge of documenting our entire project; from deciding our topic and building our event, to the day of the actual race, they've captured it all on video. And to put the actual race together, Building Team has gone out looking for supplies and is ready to get down and dirty making the blueprints come to life! 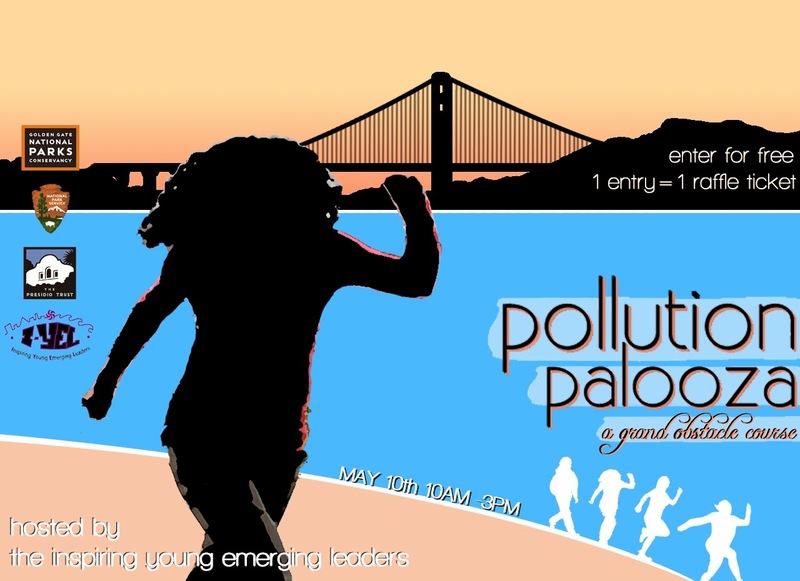 We will be hosting our event on May 10, 2014 (from 10am-3pm) at the Crissy Field Center, where participants can run an obstacle course addressing different forms of pollution including but not limited to: air, light, visual, and noise pollution. There will also be a Pollution Pavilion, where participants can learn more about the harmful effects of pollution, and how to take part in easy, day-to-day solutions! We invite all of you to put on your sneakers, sweats, and come on down to participate in our fight against pollution! Make sure you preregister for our event, and don't forget to fill out the waiver form! (18 and under waivers here) Drop-ins are welcome but forms must be signed to participate. Hope to see you in a month! P.S. Our event is completely FREE for all participants, and come back around 3 for a chance to win prizes! This year the Inspiring Young Emerging Leaders (I-YEL) is hosting a grand obstacle course for you and your friends to come enjoy the park space, and also to gain knowledge of the issues regarding pollution affecting the San Francisco Bay Area community. I-YEL interns will be working intensely for five months on our event called Pollution Palooza – an all-out party! The obstacle course will be held at the grove located next to the Crissy Field Center. We will also be capturing the event and documenting your experiences. For those who are not running, come hang out with our friendly interns! Stick around until the end, or come back, and test your luck in our raffle! 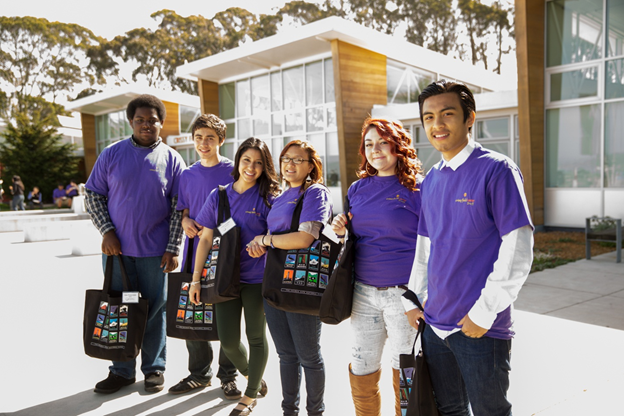 We, the Inspiring Young Emerging Leaders (I-YEL), a diverse group of high school urban youth are raising awareness of how pollution affects the San Francisco Bay Area with a grand obstacle course that will physically challenge and encourage community members to take action. By taking part in Pollution Palooza, we hope to inspire people of all ages and backgrounds to share their voices and spread awareness of pollution’s consequences on the local environment and communities. 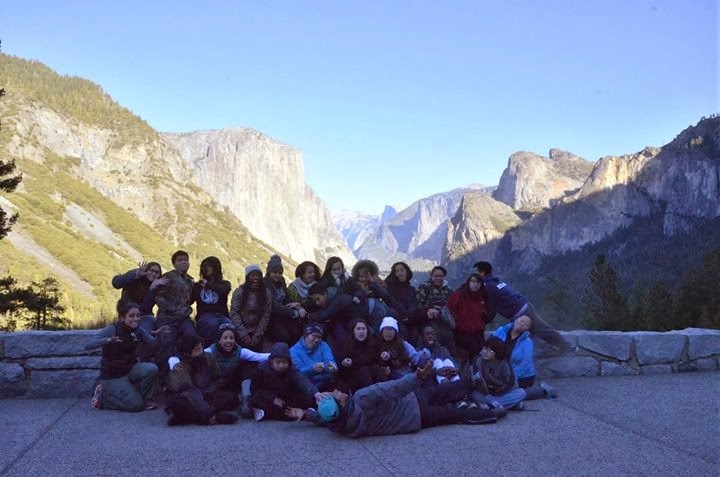 During the Martin Luther King Jr. weekend, the Inspiring Young Emerging Leaders team (I-YEL) drove to Yosemite National Park for our annual snow trip. It was like a blast from the past. Our returnees had flashbacks to the previous year because there also was no snow! We un-packed our bags and some interns explored the cabin while others prepared to lead their first lesson plans. Our first lesson plan of the trip was themed "New Year, New Goals," and we played a fun game of capture the flag. Afterwards, we had time to reflect on our past year and write a letter to ourselves about new goals we wanted to achieve in 2014. The next group challenged our minds through a Martin Luther King Jr./ Black History Month themed game of Jeopardy. The room was filled with many animal noises, which acted as a buzzer, as a result of the competitive I-YELers. After the intense and educational game of Jeopardy, we waited for our first nights meal, hamburgers and mac-n-cheese. After dinner, we participated in a star gazing activity led by the accompanying staffs, Guilder and Ilana, where we looked at the stars and told myths and scary stories. On Sunday, I-YELers woke up for an early and long drive to the Yosemite Visitor Center to get stamps for their national parks passports. 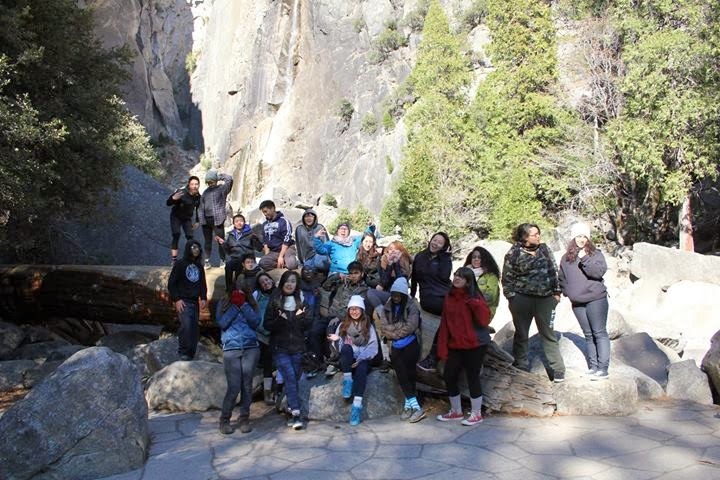 We then took a short walk to lower Yosemite falls where the third lesson plan group taught us about the history of Yosemite through playing a modified version of Do You Want to Be a Millionaire. A little while later, the team took a short van ride to Curry Village, located inside Yosemite Valley, to go ice skating. We took a long van ride back to our cabin where our fourth and last lesson plan group prepared their activity. In the activity, we worked together to get across melting icebergs and were forced to jump over electric fences to get away from zombie bears. We also learned about how global warming is affecting the world, but specifically the polar bears. The rest of the night was spent bonding with other members and some interns played an interesting game of silent library. On the last day of the No Snow Trip the team woke up for breakfast and was able to clean up the cabin in under 45 minutes! The coordinators then led a props reflection activity where we gave each other appreciation for doing an outstanding job. Backyard Bound will launch in T minus 3 months! This year, Backyard Bound youth summit will be held at the Rob Hill Campground on April 12, 2014. Prepare yourselves for amazing conversations to be made and the outdoor experiences to be shared! In previous years hundreds of youth have assembled at the Rob Hill Campground, rain or shine, to enjoy each other's company and gain further knowledge about our environment. Check out the past Backyard Bound videos here! Be prepared to be swept away by the new team of I-YEL interns. After a long and vigorous application process, new interns and our new I-YEL manager have been welcomed to the Crissy Field Center. 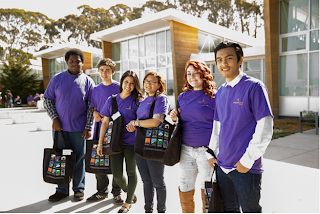 A complete group of 22 diverse San Franciscan high school interns will be working together this year on creating, yet another, YEL project which will focus on spreading awareness of current social and environmental issues in our community. Following the traditional I-YEL calendar, we have already undergone our Parent Orientation and Overnight Orientation where new interns and parents are given the opportunity to establish a sense of community and trust with one another, as well as familiarize themselves with the center. With our new I-YEL manager, Jessica, on board there have seen some changes to our meeting formats. Every Wednesday and Saturday, I-YEL interns or Crissy Field Center staff lead a current issues presentation and discussion to gain further knowledge of this issue. In addition, the I-YEL team has attended the 2013 Brower Youth Awards, LEJ restoration in the Bayview Hunters Point district, Teens on Trails, and explored the Presidio during Saturdaym! Look out for more events we will be going to and hosting soon! 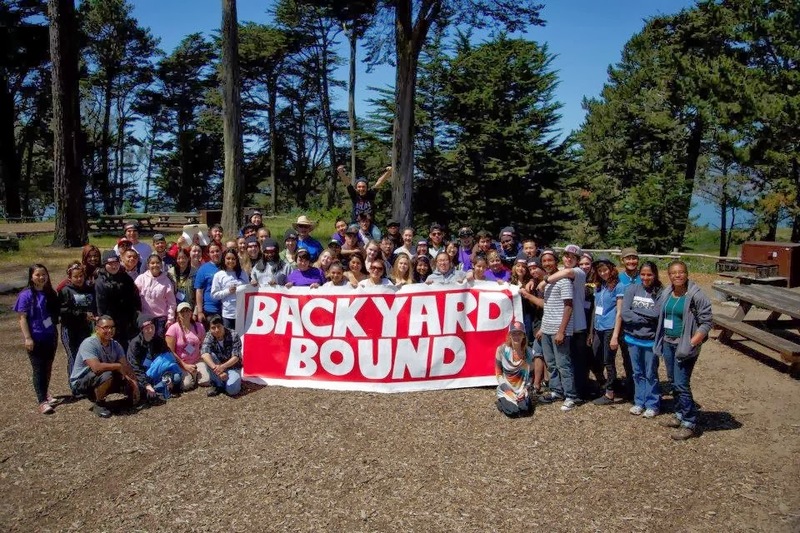 Every year, teens from around the Bay Area come together to develop outdoor activities and workshops in preparation for an annual event called Backyard Bound held at the Rob Hill Campground. 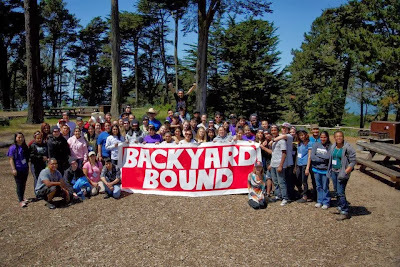 Teens from as far as Palo Alto woke up and drove to San Francisco where they were engaged in outdoor activities similarly held at the former Backyard Bound events, but lead by Crissy Field Center staff. Grace, the Outdoor Specialist, lead an epic cook off and former IYEL Alum, a current NPS ranger, Maria Jose lead an intense Healthy Parks Healthy People boot camp workout and ended with a hike to nearby Inspiration Point. All in all, it pumped up their audience and got us excited to lead one too! After lunch, I-YEL members came straight from their ACT tests to join the summit team in an all-out discussion on the positives and negatives of last year's summit. The next day we woke up, jumped back into our seats, and started choosing the workshops we wanted to lead for next year around the concepts of environment, society, and community. On the beautiful weekend of April 20-21, 2013, three I-YEL interns and various community groups hosted the second annual Backyard Bound youth summit. High school teens from all across the Bay Area— from as far as Martinez to as close to our local SFUSD high schools— came together to enjoy their local national park and discuss ways in which to engage their fellow youth to find a connection to the environment in their own way. Saturday began with various workshops and outdoor experiences, from a discussion on gender roles in society to a ropes course at Lands End. Eight participants also traveled to our very own Crissy Field Center to use the cob oven in order to bake homemade pies and learn about local food. No matter which activity they chose, each of the 70+ participants spent their entire day outdoors. Saturday evening concluded with a hefty meal catered by El Burrito Express and a campfire program as the sun set. Andy and Vincent, two members from the Ohlone tribe, plus the renowned GGNRA storyteller Ranger Fatima, kicked off the evening with multilingual stories. The first story featured Chocheño, the native Ohlone language, Spanish, English and Fatima’s infamous theater dramatics. The second story featured the use of a watermelon magically implanted with “rabbit poop,” or chocolate-covered raisins. The program continued with high-energy performances during our talent show and thoughtful reflections of the day in general. Participants were greeted to sunshine early the next morning and prepared for the Sunday discussion. Topics include Habit vs. Hype, Taking Ownership and Your Community, Your Actions. Participants brainstormed various ways to utilize social media to get youth and their families outside. For complete results of the discussion, stay tuned: an official report will be released in mid to late May. The second annual Backyard Bound youth summit ended with a closing ceremony, which allowed participants to share their discussion results, and a banner signing. Thank you to all our Backyard Bound participants! Check us out on Facebook at http://www.facebook.com/pages/Backyard-Bound/185665961581429?ref=hl. Please like our page! On Saturday April 13, 2013 the I-YEL team had the opportunity to meet with the Goldman Environmental prize winners. These six individuals came from all over the world which you could say makes them Environmental celebrities. As well, there were seven Iyelers who introduced and connected with each of the winners. All of the winners inspired our youth and helped many of them start thinking about their legacy here at the Crissy Field Center. The ceremony took place at the Crissy Field Center, where we waited for the arrival of our Environmentalist. When they arrived the six Iyelers had fifteen minutes to have a one-on-one conversation with them. At thiat time we had the chance to ask them question about their work and about the struggles that they went through to achieve their goal. As the ceremony started we all sat down in our gathering room and started with our speeches. Also, the winners had a few minutes to say some inspiring words to us after we introduced them to the audience. After the ceremony we all went outside for a group picture and planted a tree that symbolized growth and progress for each of us. Today was a very productive day for the I-YEL team. Before we got started with the day's activities, we were forced to make drastic changes to our calendar. Our play, name to be determined, was originally scheduled to be done and ready for presentation to the public in the middle of June. Due to the lack of time in everyone's schedule for this to be accomplished, we as a team agreed to push the performance dates back until the middle of July. With this move, we hope we can produce and perform one of the greatest youth led plays in the city. After the alternating decision was made, we did a script reading of our rough draft for our city awareness play with our director/playwright, Javier. After the reading, we gave feedback to the script team on their work and we are on the verge of creating some major improvements to the play. More character lines, more story line related scenes, more drama! Everyone on the team contributed on what they think would make the script better and no one's ideas were disregarded in anyway. Transitioning from lunch and a team builder led by Khari, the team split up into three teams to help support the play; the writers, the crew, and the admins. The writers continued to write the script and add more lines to all characters to give them more of a personality. The crew planned a video shoot to go along with the play and developed potential costumes for the characters. The admins worked on creating a title for the play, outreach and the budget. We felt like real business people; planning a lot of fun stuff for the public to enjoy while at the play. In a few weeks, we will have auditions for roles in the play and begin hitting the ground running with rehearsals. If I-YEL thought April was a busy month, May and June will be even busier! But we got this and I promise you, all of our hard work will pay off come July! We started off the morning by playing a game lead by Sebastian, a 2nd year intern. The game we played was an improv game where we had partners and had to act out a scene on the spot, which were suggested from the whole IYEL team. The point of the game was to help us prepare for the actual play. In case we forget our lines and we are on stage, we could improv so everything would go smoothly! After playing the fun and helpful game we all sat down and started to brainstorm for the genre we wanted for our play. Everyone is curious about the results, right? Well, after lots of debating and voting, the IYEL team has decided to have… a love story themed play! Don’t worry, this is not just another love story, we are trying our best to make this different from the others. There were many other choices, (ex. Mystery, Action, etc.) but the team thought that a love story would fit best, and that we could incorporate the other genres within it.